Whether you need entry-level wireless for a small application or wide area, outdoor coverage for a large venue, GNS Wireless carries an extensive portfolio of wireless access point equipment that can provide the correct high-performance wireless network to meet your needs. What type of Access Point & Antenna combination should I choose? Adding a GNS Wireless High Power Wireless-N, or Wireless -AC Access Point to your outdoor antenna adds extreme range, and also high speed network access for existing wired networks. Combine a high power (500mW or more) amplifier and a high gain directional antenna, and your wireless network is capable of providing up to 1.5 miles or more of point to point wireless extender. The Network Access Point you choose to work with a high gain antenna should be one that meets the needs of the particular application. Are you looking to cover a campground with high speed, and long range Wi-Fi, or are you trying to get better coverage in a large backyard, so you and family members are always connected? 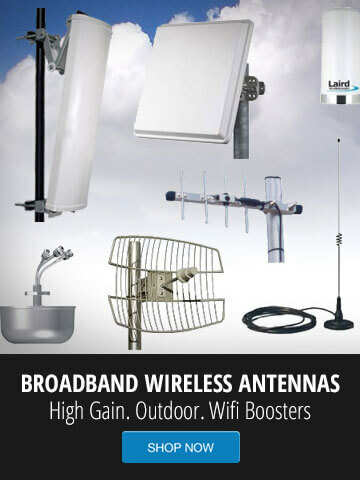 For extending coverage into the backyard, check out some of the outdoor access points that have integrated antennas built into the outdoor enclosure. For campground coverage, it would be best to contact GNS Wireless, and one of our technicians will go over the wireless access point equipment to suite your particular needs. RocketM2 is a great basic use, outdoor network access point, and has dual RPSMA-Female connectors for adding a wide range of high gain antennas, or use it for building to building applications. For more commercial and industrial use, the Cisco 3700 Series, IW3700, provides 802.11AC rates of up to 1.3 Gbps, mesh networking, removable antennas, and pervasive coverage in a small, compact outdoor enclosure. It is qualified for extreme industrial conditions, and ideal suited for manufacturing, transportation, or any other outdoor WiFi application.